The OECD’s campaign against “harmful tax competition” and “tax havens” has overshadowed the essential issue, namely the important roles that both tax competition and “tax havens” play for capital preservation and formation, leading to higher prosperity and better protection of individual rights throughout the OECD. 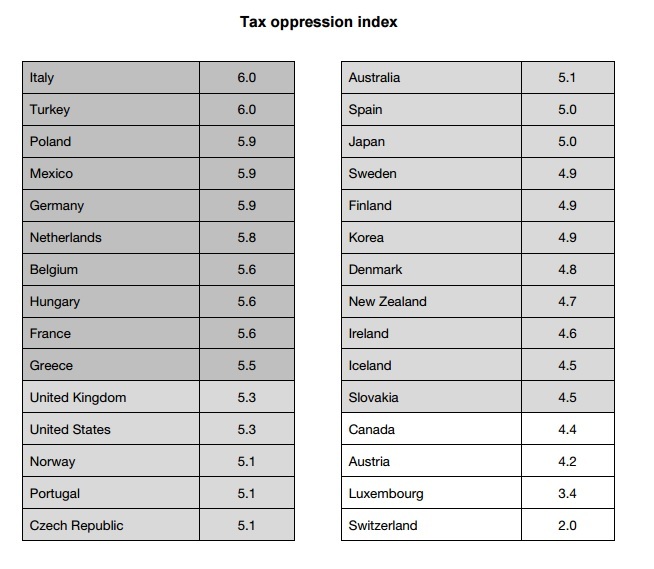 The tax oppression index is based on 18 representative criteria measuring fiscal attractiveness, public governance and financial privacy in the 30 member states of the OECD. Switzerland appears as the country with the lowest tax oppression – due to a relatively low tax burden and a more [classical] liberal institutional order, including its citizens’ right to veto legislation, political decentralization, and protection of financial privacy. Germany and France, on the other hand, whose governments have supported the OECD’s efforts, are among the most questionable states in terms of safeguarding their residents’ individual rights. …The tax oppression index evaluates the 30 OECD member states on three complementary dimensions quantified by 18 representative criteria, on the basis of OECD and World Bank data. The index enables relevant conclusions about the tax burden and individual rights among those countries. Switzerland earns the top ranking in the report, followed by Luxembourg, Austria, Canada, and Slovakia. Italy and Turkey have the worst systems, follwed by Poland, Mexico, and Germany. The United States is tied for 19th, behind even the welfare states of Scandinavia. With Obama promising the raise tax rates and increase the power of the IRS, it may just be a matter of time before the U.S. is competing for the world’s most oppressive tax regime. February 2017 Addendum: Here’s the relevant table from the study. Here is an interesting report on how unfair the US tax system is. A little old, but I doubt we have gotten better in the meantime. Clearly the US military spending renders us noncompetitive in such measures. I wouldn’t mind creating a post or elaborating on a number of the subjects you write with regards to here. Again, awesome site!